Most major monetary, fiscal, and macroeconomic economists, and financial institution and capital market experts agree, the global economy and financial system is more systemically fragile than ever before: $10 trillion bank NPLs, $13 trillion Negative Interest Rate Policy (NIRP), rotating financial bubbles – China (private loans $30 trillion), and $152 trillion global debt ($100 trillion private) – 225% GDP. According to Dr. Rasmus, Global Financial Fragility (FF) is positively related to: total financial asset investment in the system, and with interest rate maturity optimization, elasticity of inside (shadow banking) credit, and available income to service total debt levels; with inflation expectations to the change in total debt levels; with credit default and reinvestment risk; and with fiscal and monetary government subsidies, support, credit facilities, QE, bailouts, etc. (See Appendix). Financial instability in the global system is reflected in: dueling QEs and currency wars, trouble with large systemic banks (Italian/Deutsche), government and corporate bond bubbles, emerging markets dollarization of corporate debt/liabilities, oil and commodity deflation, energy junk bonds, massive flows into ETFs and U.S. equity markets, flash crashes and high speed trading systems, on-line and peer-to-pear shadow banking-lending networks, Yuan/U.S. dollar devaluation-revaluation-appreciation-depreciation volatilities, BREXIT, EU Entropy, U.S. populous election outcomes, South China Sea aggression, global GDP and trade volume secular downward decline, CAPEX under investment, labor productivity collapse, real wage-income decline-stagnation, commodity goods deflation, etc. Dr. Jack Rasmus book, “Systemic Fragility in the Global Economy” is another example of the continuing growth of literature showing how fragile the global economic and financial system really is. Dr. Rasmus builds a methodical case of the systematic fragility of the global financial-economic system, and how current central bank economic ideologies and orthodoxy have been deficient and unorthodox. Their financial-real cycle analysis is poor, their reliance on the Phillips Curve as a policy rule is flawed, they have a linearity bias, measurements of debt-income feedback effects are underdeveloped, they have a misunderstanding of financial asset price determination, their models are missing finance transmission mechanisms, etc. Their policies have made matters worse, by driving the cost of capital to zero (negative), replacing real assets for financial assets, printing trillions to bail out and purchase bad debt and defective financial products, allowing massive leakage of capital to flow unregulated (shadow banking) across globe platforms, etc. ; and all with no real affect on real economic growth, wage growth, labor participation rates, inflation rates, and more importantly standards of living or social welfare. The first part of the book is an overview of the five major economies as of 2016; the second part addresses the nine major variables that drive systematic fragility. 3) Terms and conditions of debt servicing (covenants and term structure of rates). Dr. Rasmus defines fragility as: the mutual inter-determination of these three variables; moreover, the variables function within the three main sectors of the economy: household consumption, business (financial and non-financial), and government sector. The debt-income-terms of servicing, mutually determine each other within the three sectors. The three sectors are also mutually determinative of each other; there are feedback effects between the three sectors, as well as within them. Fragility is measured as a quantitative index variable. By producing a leading index of fragility, it can forecast imminent systemic instability events. A time series (cross-section, factor analysis, data mining, simultaneous equation) regression analysis is needed of all nine (three within each of the three sectors) to determine the weights, and causal interactions. This can be done via machine learning (AI) and neural network analysis. This work is being prepared, and is ‘a work in progress’. 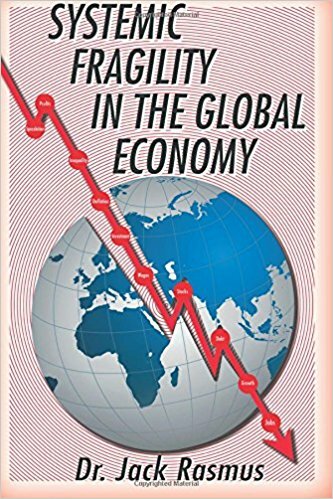 In the first part of the book, Chapters 1 -to- 6, are an overview of the degree of fragility as of 2016, in the major economies: Europe, Japan, China, Emerging Markets, and U.S.; and Chapters 7 -to- 15 are a consideration of the main drivers of financial instability: slowing investment and deflation, explosion of money-credit-debt, shift to financial assets and restructuring of financial markets, structural change in labor markets, and central bank and government fragility, the key being the change in financial structure and investment. The third part of the book, Chapters 16 -to- 18, is a critique of mainstream economics, Keynsian and Classical economic theory, Marxist and Minskyan economics, and the failure of these theories to address financial variables in post-modern macroeconomic-monetary policy theory, models and analyses. In Chapter 19, Dr. Rasmus, offers his own Theory of Systematic Fragility, as of 2016; where it is Central bankers and massive liquidity injections that are fundamental originating causes of systemic fragility, but these alone do not completely explain fragility. In the U.S., China, Japan, Europe there is a coordinated effort to correct the failures of capitalism (under investment, employment, consumption, price stability, etc. ), and the response by all central banks have been the same, a constant injection of massive amounts (trillions of U.S. Dollars, Yen, Euros, Pounds, Yuan, Peso, Rubble, etc.) of liquidity (credit) to back-stop, set a support, and prop up asset prices. However, this leads to asset price bubbles and asset price collapse (financial/currency crisis/stagnation/deflation/under employment-investment), crisis more frequent since 1995 (Peso Crisis, Thai Baht, Russian Default, Y2K/911, Housing Bubble, Financial Crisis, etc. ), and global central bankers (governments) now do not have the balance sheets to deal with future crisis; and have not fixed the real problem underlying the economy, they have only created a monetary illusion of policy effectiveness: dead-cat bounce recoveries, emerging market currency collapse, Japanese perpetual recessions, Europe’s stagnation, and China’s asset price hyper-inflation and debt crisis. The perfect example of this financial-economic fragility is Japan. Over the last 17 years (1990 – 2017), the Bank of Japan (BOJ) implemented aggressive forms of unorthodox monetary policy (Negative – Nominal/Real — Interest Rate Policy/Quantitative Easing): printing massive amounts of money, buying massive amounts of sovereign-corporate (infrastructure) bonds, driving bonds yields negative, and driving domestic investors/savers (negative effective rates), and financial institutions (disintermediation), literally crazy. Japan will be the ultimate experiment in monetary-fiscal policy mistakes, as they will have to resort to even more extreme measures to try to get themselves out of their existential structural crisis. The ultimate fiscal-monetary response could be, with unintended political-economic-cultural consequences, from a massive and coordinated debt forgiveness, by both fiscal/monetary authorities, is unknown and untested in modern monetary history. Japan is extremely fragile, as at some point they will not have the tax revenues to service the sovereign debt payments, and will theoretically fall into default, and will ask for forgiveness, not from bond holders, but from the BOJ, that owns the majority of the debt. Not only is Japan’s economy and financial system extremely fragile, but so is Europe. The actual European Central Bank (ECB) structure (dominated by Germany – Bundesbank) is a major impediment in its ability to respond to current crisis: fiscal austerity, inability to devalue the Euro, fear of hyper-inflationary trends, and misspecification of monetary policy targets (inflation, productivity, employment, wages, and exchange rates). Poor performance (contagion), bank crisis (runs on banks), social unrest (extreme right-wing populism), massive debt issuance, and deflation (liquidity trap/collapse of money velocity) is the costly (stagnation) result of policy mistakes. This — along with the lack and hesitant response to bank runs in Spain-Greece-other EU countries — has had a significant negative impact on ECB independence and credibility, in regards to the ability to respond to future financial and economic crisis. Not only is Europe’s economy and financial system extremely fragile, but so is China. The Asian Contagion of the late 1990s required massive bank and corporate bailouts (recapitalizations). The 2000s, witnessed a modernization of the Peoples Bank of China (PBOC), as a central banking institution through banking reforms, conversion of State Owned Entities (SOEs) to private-public firms (privatization toward a more Japanese Keiretsu system), pushing for more export-oriented policies (higher-value commodities-services), and larger government sponsored infrastructure projects (commercial-residential-dams-roads-power plants, etc.). Excessive industrial and monetary policy is unsustainable, and will have significant negative externalities on the global economy. The next financial crisis, in China, will come from the excessive extension of credit from both fiscal and monetary authorities, and will come from government and corporate bond market defaults, as the system is severely over-leveraged. China is using more and more debt to fix bad debt problems, and the simulative multiplier-accelerator effect on the economy is deteriorating (decelerating) quickly. Systematic fragility is not only experienced at the microeconomic (country/market) level, but manifests at the macroeconomic (systemic/systematic/institutional) level. Systematic fragility is made up of financial, consumption and government fragility; and intra-sector fragility, is caused by debt levels (rate of change), income (servicing of debt), and terms and conditions of servicing of debt. Transmission mechanisms between these factors and sectors are price systems (financial/commodity), government policy (monetary/fiscal), and psychological expectations (investors/consumers). What is important, is fundamental forces and enabling factors driving fragility are: the end of Bretton Woods, central bank managed float systems, ending of international capital controls, the liquidity explosion, debt escalation, financial asset investment shift, and the rise of the new global finance capital elite; and financial deregulation, global digital-network technology, financial engineering (derivatives) revolution, highly liquid financial markets, financial restructuring and emergence of the shadow banking system. Globalization, technologicalization and deregulation/integration is accelerating capital flows and accumulation, and concentration of capital to targeted and non-targeted markets across the world, fundamentally restructuring markets and institutions. This process is continuing at a rapid pace, and depending on the recipients, is economically, financially and politically (institutionally) destabilizing, destructing and deconstructing liberal-democratic-capitalism. Financial product innovation and advancements in the use of technology for trading purposes, is accelerating the shift from real to financial asset investment — and with the rise of global equity, debt, and derivative markets – is changing the institutional structure, and exacerbating the fragility and instability, of the global financial system. Central banks bailed out the private banking system, and will again – along with other strategic affiliated institutions, corporations, businesses and brokerages — by printing massive amounts of fiat currency (seigniorage), to buy (defective/defaulted) securities product (derivatives), accumulate more sovereign-corporate-personal debt, with even more crowding out effects, and with no real eventual long-term impacts on real economic growth, wages, and productivity; and social welfare or standards of living. Only asset prices bubbles and a massive redistribution and concentration of wealth will occur. Global capital markets, financial institutions, governments, businesses, and consumers are sitting on an extremely fragile system. This is obvious when looking at the level of government debt, service. It is estimated, between the U.S Federal Reserve Bank, Bank of England, and European Central Bank, $15 trillion direct liquidity injections, loans, guarantees, tax reductions, direct subsidies, etc. have been used. If you add in China and Japan, the total gets to as high as $25 trillion, and if you add in other emerging country (Asian, Latin America, and Middle-East) central banks, the total gets as high $40 trillion. Add in inter-temporal substitution (opportunity costs) over 40 years, we are looking at hundreds of trillions of debt, and debt service. What perpetuates this reliance on debt, and debt service, is the misconception of valid economic theory and analysis, and its real application. It is obvious, global monetary and fiscal policy responses have made the global financial and economic system even more fragile, and eventually insolvent and bankrupt, and modern central banking is ineffective and has put us into a perpetual liquidity trap, the velocity of money has collapsed. There is no money going into real long-term (capital budgets) assets, only short-term financial assets (equity, fixed-income, ETFs, derivatives, structured products, crypto-currencies, etc.). This has led us into the contradiction of macroeconomic theory, monetary policy and central banking: liquidity-debt-insolvency nexus, the moral (immoral) hazard of perpetual bail-outs, growing concentration of wealth at the extremes, growing perception that Negative/Zero Interest Rate Policy (N/ZIRP) can fix under-investment in capital (human/physical) and deflationary (disinflationary) trends, and that current banking regulation-supervision is bad for the economy, financial services (institutions) industry, and for institutional and retail investors (savers) in the long run. And unfortunately, these techniques and tools have been used by other Global Central Governments and Banks (BOJ/ECB/BOE/PBOC), with similar, disastrous, and disappointing outcomes. The focus is on saving the financial institutional system in the short-run, using extreme and un-orthodox monetary policies (tools), with a lack of concern or understanding of long-run economic, social, cultural, and political consequences and outcomes. This is the true reflection, of failed conceptual frameworks, of contemporary economic analysis. Dr. Rasmus presents a true theory (model), of Systematic Fragility, a proxy for instability, a measure and quantitative score, used to forecast financial instability events, measuring pre-post-crash-recession cycle phases, it is a simultaneous equation-solution, the weights and factors are non-linear relationships, and are determined through the use of machine-learning (AI) algorithms, that adjust the factors, equations, and outcomes in real (continuous) time. For example, over the last 10 years, the Fed accumulated over $4.5 trillion in bank reserves/balance sheet (bonds), made up mostly of mortgage backed securities and U.S. government Treasury notes and bonds, the average size of the balance sheet prior to the financial crisis was $500-to-$800 billion. Since these were mainly reserves creation, and an addition to the monetary base, and not really the money supply, the policy effects (QE/(Zero-Negative Real Interest Rate policy) have been mute. The real cause of deficient real-macroeconomic performance, is a collapse in the velocity of money, driven by alternative forms of money creation and flows across the globe (cryptic-digital currencies-shadow banking, etc. ); the lack of fiscal labor market policy to lower under-employment and raise labor market participation rates; and resolve to solve other social, cultural, political and economic disruptions. Making it now impossible to conduct monetary policy. With the U.S. fiscal debt totaling over $22 trillion (interest payments +$1.0 trillion per year), the Feds Balance Sheet totaling $4.3 trillion, the potential for continued -perpetual war (defense spending) and entitlement expenditures, and political and policy uncertainty (next Federal Reserve President) there is little room for monetary and fiscal solutions to fight the next financial and economic crisis. Neoliberal new-classical macroeconomic theory is flawed, at best, as it relies on the primacy of central bank monetary policy, tax structure shifts, free trade theory, running of twin deficit systems, allows for major labor market restructuring, leading to wage compression, drives toward privatization of public goods and institutions, and fiscal austerity, and financialization-fiscalization of elites, institutions and products. Most major monetary, fiscal, and macroeconomic economists, and financial institution and capital market experts agree, the global economy and financial system is more systemically fragile than ever before. According to Dr. Rasmus, shows us that global Financial Fragility (FF) is positively related to total financial asset investment in the system, and with interest rate maturity optimization, elasticity of inside (shadow bank) credit, and available income to total debt levels; with inflation expectations to change in total debt levels; with credit default and reinvestment risk; and with fiscal and monetary government subsidies, support, credit facilities, QE, bailouts, etc. (See Appendix). Government policies have made matters worse, by driving the cost of capital to zero (negative), replacing real assets for financial assets, printing trillions to bail-out and purchase bad debt and defective financial products, allowing massive leakage of capital to flow unregulated (shadow banking) across the globe, etc. ; all with no real effect on real economic growth, wage growth, labor participation, inflation, standards of living or social welfare. These failures and fragility are reflected in increased volatility in social and economic indicators, capital market pricing and investment risk, and resulting reductions risk-adjusted returns, inefficient allocation investment capital and resources, and falling employment and real income growth rates, standards of living and overall social welfare. The conclusion, if this system of unorthodoxy continues — and I believe it is too late to address the systemic and systematic risks associated with the economy, government, and central banking — exposes the economy, financial institutions and capital markets, to failure, again, at an ever higher social price. The reality is our economic and financial system are extremely fragile, and we are facing ever higher systematic-systemic credit default (illiquidity) risk, and another severe financial crisis, great recession and depression, as our tools and system are ineffective and broken. Dr. Souza has 27 years of experience in commercial and residential real estate economic research; and is Real Estate, Financial and Investment Economist for: Pillar6 Advisors, LLC; Johnson Souza Group, Inc.; CapitalBrain.co, and GreenSparc. Dr. Souza holds degrees in: accounting, finance, economics, public administration, information systems and political science; and Doctorate in Business Administration (DBA) with a concentration in Corporate Finance.